See We Remember Bonn and 17 1/2 Minutes - An Eternity, by Al Dussliere. 287 (18 Dec 1944), 288, 289, 290, 293, 294, 295, 296, 297, 298A, 298B, 299, 300, 306, 314, 315, 316(AS), 317, 321, 322, 323, 324, 325, 326, 328, 329, 331, 333, 337, 338, 339, 341, 342, 343, 345 24 March 1945). 1Lt Grafton N. Smith (P) - First three missions with experienced combat Pilots flying as CoPilots: 2Lt Oliver T. Eisenhart (287); 2Lt Louis E. Reed (288, 289). 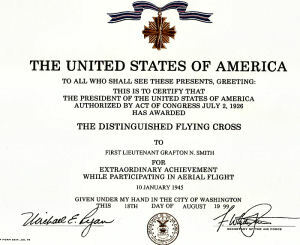 All missions flown as First Pilot. 35 mission combat tour completed on 24 March 1945. 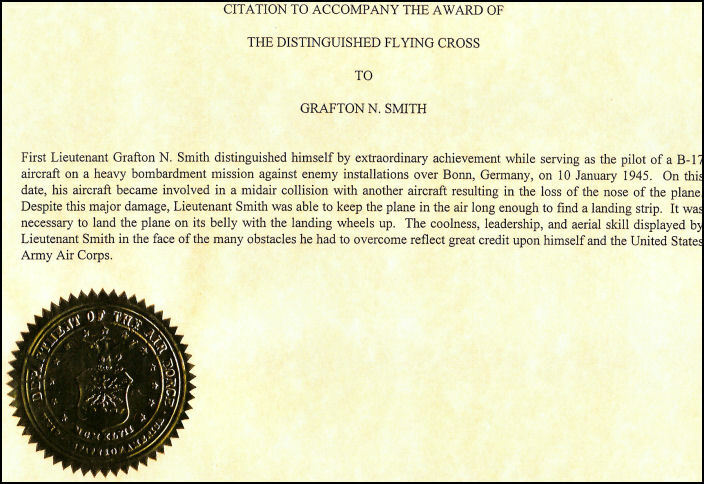 1Lt Grafton N. Smith was awarded the DFC Medal for his actions on Mission 300, 10 January 1945 to Bonn, Germany. 2Lt Melvin Alderman (CP)(KIA) - Flew on all of the 1Lt Grafton N. Smith missions except for 287, 288 & 289 when he stood down. Flew with another Pilot on 1 mission: 2Lt Hower E. Bitler, Jr. (348); Was upgraded from CoPilot to Pilot and flew on two missions as First Pilot (349 & 353). Was Killed in Action on mission 353, 6 April 1945, to Leipzig, Germany in B-17G 43-38958 Green Hill Belle (427BS) GN-H in a mid-air collision, shortly before reaching the target, with B-17G 44-8647 (No name) (360BS) PU-M, 2Lt Howard C. Lacker, Pilot. 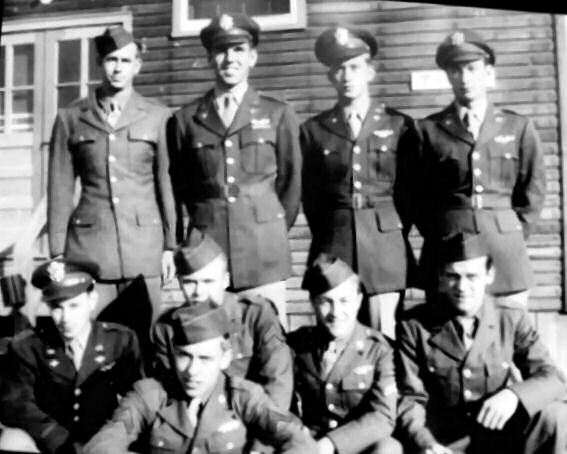 The entire 17 crewmen in the two B-17s were KIA in the crash over Germany. (MACR 13719 & 13596). 2Lt Edward W. Gardner (N)(POW) - Flew on 12 combat missions with the Lt Grafton N. Smith Crew - 288, 289, 290, 293, 294, 295, 296, 297, 298A, 298B, 299, 300. F/O William F. Dohm (B)(POW) - Flew on 13 combat missions with the Lt Grafton N. Smith Crew - (All of the 2Lt Gardner missions plus 287). On mission 300, 10 January 1945, the Lt. Grafton N. Smith Crew B-17G, 42-39875 Buzz Blonde (427BS) GN-C suffered a mid-air collision with B-17G, 42-97861 Iza Vailable II (360BS) PU-C just after "bombs away." Both B-17s were tossed around for several minutes before being brought under control by their Pilots and CoPilots. Lt Gardner and F/O Dohm bailed out of their B-17 due to damage in the nose and in their belief that their B-17 was out of control. Both became POWs (MACR 11575). 1Lt Grafton N. Smith was able to bring his B-17 under control with oxygen system, interphones and heating equipment out at temperatures at minus 60 degrees. A wheels up landing was made at Airfield A-97 at Sandwiler, Luxembourg and later returned to Molesworth. See crash photo and map here Tail Gunner, Sgt Marion M. Mooney, on the 2Lt Roy F. Statton crew was KIA when the tail compartment was severed from his B-17 (MACR 11576). Lt Statton, and his CoPilot 2Lt David A. Schroll, made an emergency landing at Airfield B-53 at Merville, France. Both were awarded the DFC medal for their skill in controlling and landing their damaged B-17. S/Sgt Paul F. Gray, Togglier, flying as a substitute for Bombardier F/O William F. Dohm, was wounded on mission 306, 22 January 1944. 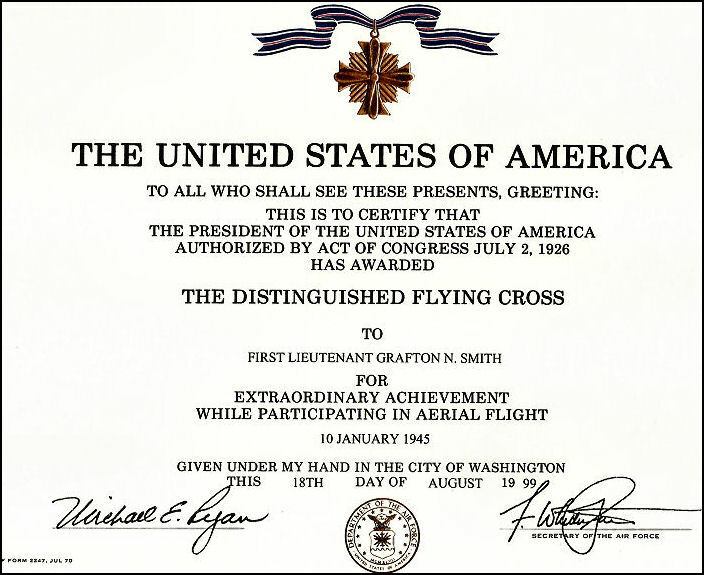 T/Sgt Joe A. Hardin (E/Tog) - Flew on 12 missions as Flight Engineer with the 1Lt Grafton N. Smith Crew - 287, 288, 289, 290, 293, 294, 295, 297, 298A, 298B, 299. Flew on 23 missions as Togglier with other Pilots - 311, 312, 313, 314, 315, 316, 318, 319, 320, 321, 322, 323, 324, 325, 326, 328, 331, 343, 345, 346, 355, 357, 359. 35 mission combat tour completed on 14 April 1945. 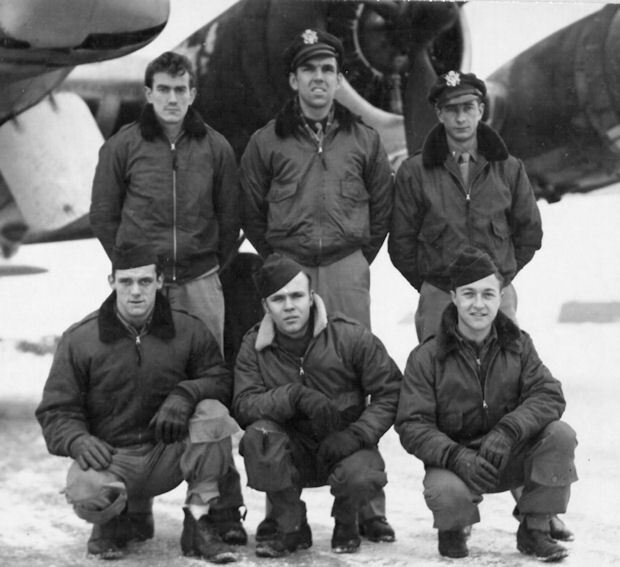 S/Sgt George F. Parker (R), Sgt Raymond M. Miller (BTG) - Flew on all of the 1Lt Grafton N. Smith Crew missions. S/Sgt Parker was wounded on mission 306. Both completed their 35 mission combat tour on 24 March 1945. S/Sgt Albert L. Dussliere (WG/TG) - Flew on all of the 1Lt Grafton N. Smith Crew missions - As Waist Gunner - on 20 missions 287, 288, 289, 290, 293, 294, 295, 296, 297, 298A, 298B, 299, 300, 306, 314, 315, 316, 317, 331, 333. As Tail Gunner on 15 missions 321, 322, 323, 324, 325, 326, 328, 329, 337, 338, 339, 341, 342, 343, 345 when the Waist Gunner position was not used. 35 mission combat tour completed on 24 March 1945. Sgt Melvin Howell (TG) - Flew on 14 missions with the 1Lt Grafton N. Smith Crew - 287, 288, 289, 290, 293, 294, 295, 296, 297, 298A, 298B, 299, 300. Was wounded on mission 306, on 22 January 1945 and placed in a Ghent, Belgium hospital and flew no additional combat missions and was returned to the USA. Substitute Tail Gunners were then used. Mission 300, 10 Jan 1945 - Midair collision Lt Smith landed in Luxembourg and returned to Molesworth. Ragged But Right - 43-38621 (GN-E) - 3 missions (324, 328, 331).